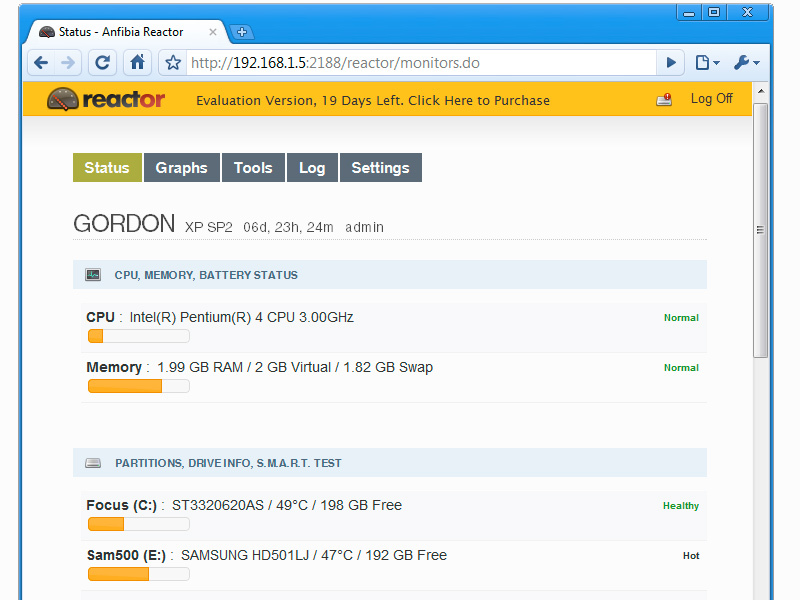 Anfibia Reactor is a web-based server monitoring solution for Windows. Anfibia Reactor monitors cpu, memory, battery, hard drives and makes sure network connections are working, checks databases and much more! Anfibia Reactor is fast and amazingly easy to install and use. Monitors network connections (secure and insecure): HTTP, FTP, SMTP, POP, DNS, ICMP (ping). Monitors and queries databases: Microsoft SQL, ORACLE, MySQL, Generic OLE DB. Anfibia Reactor is fast Web-Based Server Monitoring solution for Windows. ...... Anfibia Reactor runs on modern Windows platforms, and modern web browsers. Anfibia Reactor is a server monitoring solution that runs on your own server, meaning you have full control over your private data, setup and configuration, and is web-based, meaning it is accessible to you via a web browser from any computer, and iPhone. * Monitor hardware, such as hard drives, cpu, memory, battery. * Monitor network connections (secure and insecure): HTTP, FTP, SMTP, POP, DNS, ICMP (ping). * Monitor and query databases: Microsoft SQL, ORACLE, MySQL, Generic OLE DB. * Monitor running services, applications. * Reboot, shut down computers. Qweas is providing links to Anfibia Reactor 4.1 as a courtesy, and makes no representations regarding Anfibia Reactor or any other applications or any information related thereto. Any questions, complaints or claims regarding this application Anfibia Reactor 4.1 must be directed to the appropriate software vendor. You may click the publisher link of Anfibia Reactor on the top of this page to get more details about the vendor.